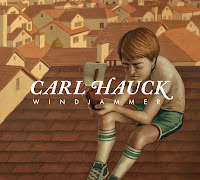 Download MP3: Carl Hauck - "Martial Riesling"
Listening to Windjammer, the new album from Chicago singer-songwriter Carl Hauck, is an amazingly intimate experience. Sometimes sounding a bit sorrowful, sometimes hopeful, Carl gives us close-up look inside his mind with performances that aren't allowed to hide behind heavy instrumentation or overwrought production. It makes his talent crystal clear. Take opening track "Martial Riesling," for example, which sounds about as beautiful and heartfelt as music can get. Carl has two shows coming up to celebrate the album's November 9th release. The first is scheduled for November 5th at Mike 'n' Molly's downstate in Champaign, which he'll follow up with a November 10th Chicago show at Martyrs. In anticipation of Windjammer's release and the upcoming shows, Carl took some time out for a Q&A with WCR, filling us in on more about himself and his music. Read on. WCR: At 23, you already have quite a bit of music under your belt. Tell us a bit about how you got started performing and recording and how you feel you’ve evolved as an artist since your first album in 2004. CH: I started playing guitar as a third grader, but I didn’t become serious about music until freshman year of high school, when I joined a pop punk band with some friends who were perhaps unaware of the contraceptive reference in the name "Morning After." When the band was forced to call it quits after the other guitarist moved away, I started writing solo music, but it was pretty different from the kind of music I play today. It was very much informed by the Warped Tour-style bands I listened to at the time, the kinds that preyed upon hormone-charged teenagers with hyperbole and schmaltz. And, as a hormone-charged teenager, I idolized that sort of thing. I haven’t really listened to those first couple albums in a while, but I like to think that just about everything with regard to my music has become more nuanced – the lyrics, the vocal delivery, the finger-style guitar, the production quality, etc. It’s always difficult to pinpoint specific influences, since I consume and listen to new CDs at such an alarming rate, but the music I’ve truly connected with over the last seven or eight years has definitely had a huge impact on the way I approach my own music. Let’s just say it’s different from what I listened to in early high school. How would you say your new album, Windjammer, compares to your older work? Was there anything in particular that inspired this batch of material? With my third album, Counter Intelligence, I took a conscious step away from deeply personal, confessional lyricism and tried to write something that was slightly more distant and, to an extent, bitingly ironic. The lyrics dealt a lot with politics and organized religion, but there was still an inextricable personal element to it. With Windjammer, the focus became almost entirely personal. Most of the songs have a warmer feel to them because they revolve around subjects like the meaning of home and love, and the innocence of childhood—things I happened to be thinking quite a bit about as both a junior and senior in college. It was a time of transition, but it was an overwhelmingly positive one. Musically, there are a couple tunes that are almost entirely acoustic guitar and vocals, which means they reflect my usual live setup, but most of the other songs are filled out and orchestrated by friends. I don’t know why, but with each release I find myself trying to get more and more people involved. Do you have any personal favorite songs on the album, or ones you’re most anxious for people to hear? My favorite recordings on the album are probably “Windjammer” and “Martial Riesling,” but I’ll share the stories behind a couple other ones. Anyone who’s been following my music for the last three years has probably heard “Coffee on the Rocks”; I’ve recorded multiple versions since it was written, and I continue to play it at just about every show. The story behind the song is that I worked for four summers as a foods “employee” (I refuse to use the accepted job title of “host”) at Six Flags, and I dreaded each and every day of it, starting with my very first day, when an international employee from Ghana cut his hand in the cotton candy machine. By my fourth year, they made me a supervisor, which meant that not only would I have to continue frying chicken for thousands of “guests” in 95-degree weather, but I’d have to do so for longer hours while wearing a dress shirt and tie. I started writing up the lyrics for “Coffee on the Rocks” while driving home late one night, and I think it really echoed the sheer banality of the work day that I was seemingly living on repeat that summer. 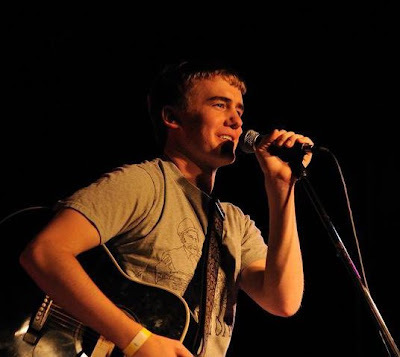 The song that follows “Coffee on the Rocks” on the album, “Rooster," was inspired by a man I met while opening for Cameron McGill at Mike ‘n’ Molly’s in Champaign. He seemed to be a fixture at the back of the beer garden, belligerently heckling just about everything that moved, except me for some reason. He was apparently pleased by the fact that I played slide guitar for a song, and he hooted and hollered for the rest of my set. He introduced himself as “Rooster” (not unlike another C-U man named “Rebel,” who inspired a song on Counter Intelligence), and we talked for an hour or two, in which time he told me his life story and how he’d been screwed over in relationship after relationship. It all culminated with the advice of someone who’s been hurt one too many times: “don’t ever settle down with anyone.” He became this tragic figure in my mind, one I assumed I’d never see again, but he ended up appearing in the back at another one of my shows at the same venue. Unfortunately, though, he passed out in his chair and was asked to leave. Before even listening to Windjammer, I was intrigued by the album’s title and cover art. What is the significance behind them? I grew up on a street named “Windjammer,” so I felt that my childhood memories of playing on the street would highlight some of the album’s nostalgic undertones. In addition to that, I really liked the idea of a young sailor trying to find his way in a current of water and wind. It seemed fitting. The cover art was painted by a Brooklyn artist named Casey Weldon. I came across his artwork online and loved that it seemed to deal heavily with suburban adolescence, but in a moody, dark way. We shot a few ideas back and forth over e-mail, and one of the ideas he came up with was the image of a boy holding a toy boat on a rooftop in suburbia. Your music has been compared to the likes of Andrew Bird, Iron & Wine and Sufjan Stevens, which clearly comes through in the material. Are there any artists who people might be surprised to learn you consider influences? One of my favorite bands in late high school was Pink Floyd, and I’m sure certain elements of albums like Animals, Wish You Were Here and Meddle have influenced my music in some way I probably can’t put a finger on. The majority of what I listen to fits loosely into the genre of my own music, but I also love bands like Elbow, The National and Radiohead. I guess there’s something to be said for rock music that’s brooding, lyrically cryptic and slightly experimental. Having played shows around the U of I campus in Champaign-Urbana and then in Chicago, how would you say the two scenes differ? Have you noticed differences in the way audiences respond to your music? I would argue that both scenes deceive themselves in claiming that they’re musically eclectic. Both Chicago and C-U are largely rock towns with shows booked and attended by fans of rock music. As a solo acoustic artist, I’ve found it hard to book shows with talent buyers who know that a one person act doesn’t draw as many as a five person 80s cover band. And then you get to the show and you’re dismissed by the audience before you start playing because they see the acoustic guitar and peg you as either a Bob Dylan wannabe or an even worse version of Chris Carrabba. I shouldn’t complain about C-U, though, because I received some great musical opportunities that I wouldn’t have gotten if I wasn’t in a college town market. I’ll have to get back to you about Chicago, though. I’m still trying to find a place to break in. I feel like a cat burglar. You’ve played gigs with some other great acts such as Cameron McGill and Joe Pug. Do any shows stand out as particularly memorable? I don’t want to fault bigger touring acts for not wanting to sit through the whole show, but both Cameron and Joe didn’t watch me play a single song or say a word to me when I opened for them, so those shows weren’t exactly memorable, even though they played solid sets. A couple of fairly big acts that were both fantastic live and extremely nice in person were The Daredevil Christopher Wright and Pearl & the Beard. I don’t know if I played particularly well on either occasion, but I always enjoy experiencing that sense of camaraderie among the people with whom I’m sharing the stage, even if they blow me out of the water as musicians. Now that you’ve completed Windjammer, what’s next? Any plans to tour? I really wish I could tour immediately after releasing the record, but that’ll probably have to wait until summer, since I’m a high school teacher. Once June or July rolls around, we’ll have to pretend the record just came out again.